This past year, I have attended several layout operating weekends. Of course, I go mainly for the experience of operating on a range of quite diverse layouts. But part of the experience is also the simple pleasure of viewing impressive layouts up close and in detail. I always enjoy these events, and typically have several really good operating sessions, but the diversity of the layouts always leads me to mull over what layouts can show you, as well as the ways you can learn from them. Some readers will notice that I characterized the layouts visited as “impressive.” Are they all of the quality that has been in (or should be in) publications such as Great Model Railroads, the Kalmbach annual magazine? No, a fair fraction of them aren’t that kind of layouts. So why did I call them “impressive?” The simple reason is that there is so much to see in even a modest layout, so much that the builder has done, so many problems solved in invariably interesting ways, that I always find it a rich experience. I once remarked to someone, that a layout is such a personal expression, so revealing of its builder, that one might feel surprise that owners even let us see them. Of course the personal part is neither embarrassing nor really private, but it certainly is individual. This extends to so many parts of the layout: its design, its quality of trackwork, its scenery and structures, the rolling stock, and even to the choices of operating procedure and car movement system. All these features are best appreciated during operation, when the layout “comes to life” as (presumably) the builder intended, but even a brief visit can yield considerable insight. To choose just one example on the operating side, which happens to be one of the finest layouts in the country, I always enjoy an invitation to operate on Bill Darnaby’s Maumee Route in the Chicago area. So much of the layout reveals careful thought and planning, and so many details jump out at you, that it is almost hard to appreciate it all, and I would say multiple visits are needed to really grasp what is there. 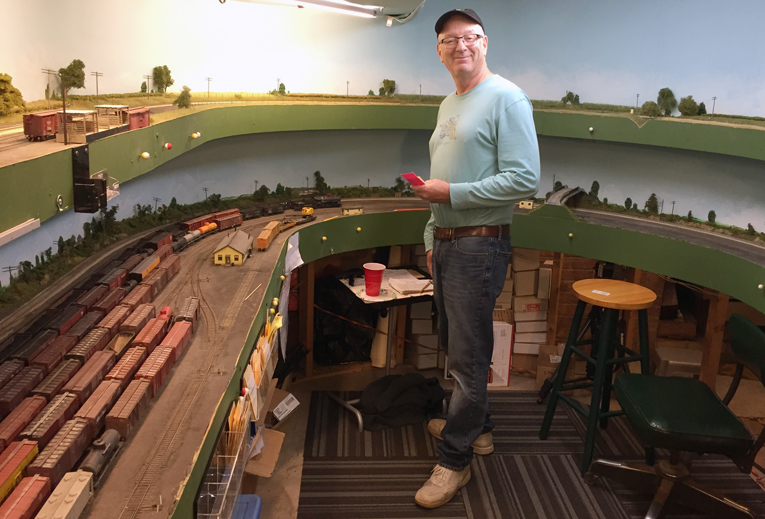 Just as a single illustration, shown below is Phil Monat, who was yardmaster at the Maumee’s East Yard (at lower left), during a session last October. Phil looks cheerful, though I know he was kept quite busy running this active yard! But a layout need not have the extensive completeness of the Maumee to be both interesting to operate, and interesting to understand, as a layout design. I mentioned Rick Watson’s excellent Southern Pacific Exeter Branch layout in my post about Desert Ops 2018 (you can see that post at this link: https://modelingthesp.blogspot.com/2018/11/desert-ops-2018.html ), and here is another view of it, showing part of the yard in Exeter. 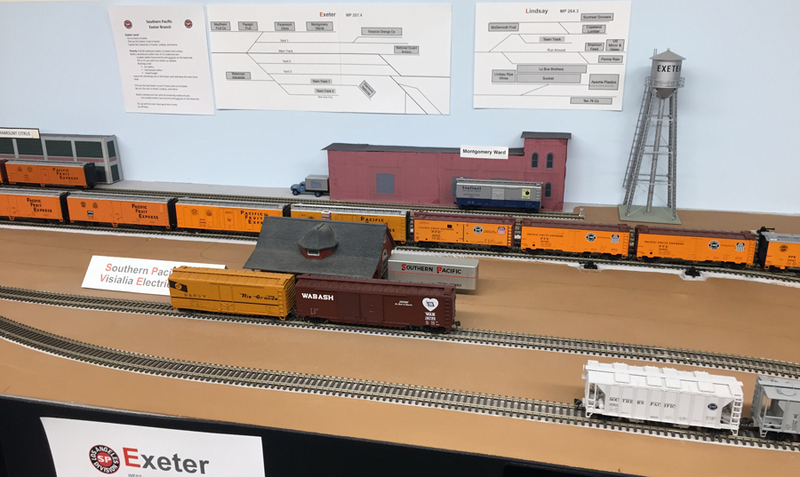 This is not detailed or scenicked, and the industries are minimally represented; but note on the wall, there are detailed and specific maps to guide switching moves. There is in fact much to learn here, even if it is not the “conventional” beautiful layout. I have often mentioned to people, that I can’t remember ever visiting a layout, even the ones at the stage of plywood and track only, without learning something, or seeing something interesting, or getting an idea that I can use. 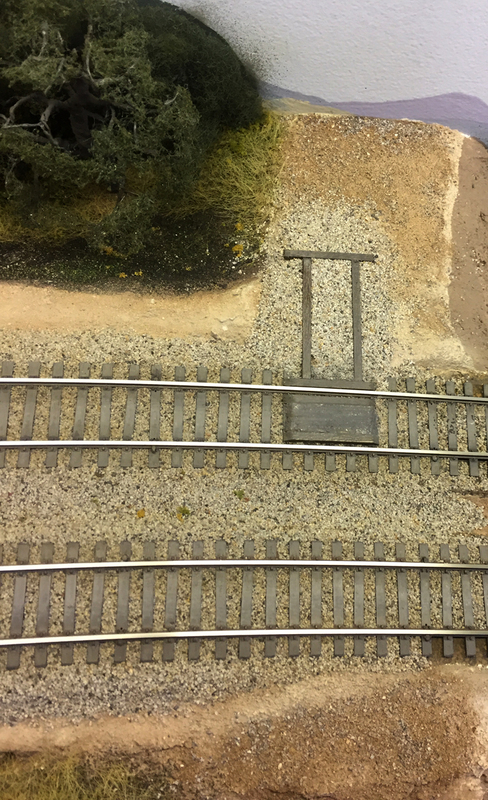 That is just another product of how much of a layout owner is poured into the layout, even in its early stages. To choose just one instance of what I’m talking about, I visited Paul Chandler’s outstanding SP layout in Tucson as part of the Desert Ops visit last month. He has modeled something I need to include on my layout: pullouts for motor cars or hand cars. The photo below shows an example from his layout. This is simple, familiar from the prototype, yet not often modeled. I will definitely do a few of these for my layout! The message here? Layout visits are always worthwhile, even early in a layout’s life. And when you walk into a layout room and see minimal scenery, don’t stop looking. There is a lot to see and learn, at every stage of layout development. You will get ideas, usually multiple ideas, from every layout you visit, even if you don’t get a chance to operate. So do visit layouts when you get the chance, and make the effort to see what is distinctive and original about every one. You may be surprised how much you learn!